In the Gold Coast Commonwealth Games, Indian wrestlers bagged 2 Gold, 1 Silver and 1 Bronze medal on the opening day of their competitions today. 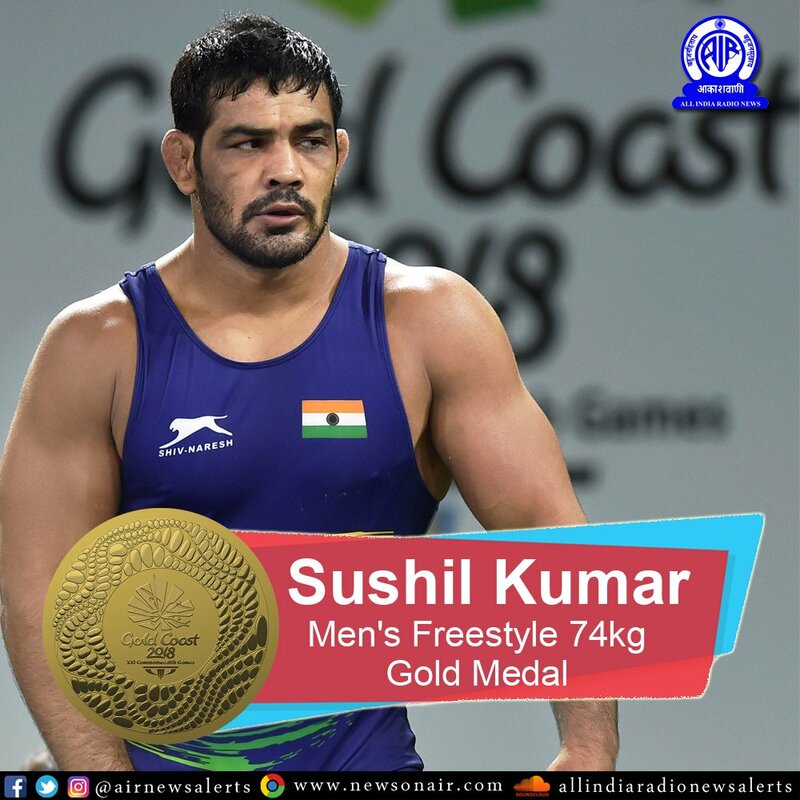 The Gold medals were won by veteran Olympian Sushil Kumar in the 74 kg category and Rahul Aware in 57 kgs. While Sushil brushed aside South African Johannes Botha, 10-0, Rahul defeated Steven Takahashi of Canada, 15-7. In the Women's 53 kg category, Babita Kumari claimed the Silver after she lost to Canada's Diana Weicker, 2-5 in the Final. Kiran clinched the Bronze in the 76 kg division following a stunning 10-0 win over Katouskia Pariadhaven of Mauritius. In Shooting, India's Tejaswini Sawant bagged a Silver in the Women's 50-metre Rifle Prone event. She finished second with a score of 618.9 points, behind Singapore's Martina Veloso who created a Games record with a score of 621. It was India's 12th medal in Shooting. In Stage 1 of the Qualification of the Men's 25-metre Rapid Fire Pistol event, Neeraj Kumar finished at the top, while Anish was third. Stage 2 is yet to begin. In Badminton, PV Sindhu and Kidambi Srikanth secured a quarterfinal berth after winning their respective Round-of-16 matches. Srikanth, who won the Mixed Team Gold in the ongoing Games, has now become world number one in the Men's ranking. He is the first Indian male shuttler to achieve the feat and the second Indian overall after Saina Nehwal. Saina is yet to play her pre-quarterfinal today. The teams of Satwiksairaj Rankireddy and Ashwini Ponnappa, and Pranaav Jerry Chopra and N. Sikki Reddy have progressed to the last-8. In Table Tennis, Achanta Sharath Kamal, Manika Batra, Mouma Das and Harmeet Desai have made it to the quarterfinals. The pairs of Achanta and Mouma, Manika and Sathiyan Gnanasekaran, and Sanil Shetty and Madhurika Patkar also booked a place in the Mixed Doubles last-8. In Men's Triple Jump, Arpinder Singh and AV Rakesh Babu qualified to the Finals. Women Discus Throwers Seema Punia and Navjeet Dhillon will feature in the Finals later today, while Nayana James and Nellickal Neena will be trying their luck in the Women's Long Jump. In Women's Hockey, India will take on Australia in the semi-finals. All India Radio will broadcast live commentary on the match. It can be heard on the Rajdhani, FM Gold and other channels from 4:40 pm onwards. India is currently third in the medals tally, with 14 Gold, 6 Silver and 9 Bronze. Australia continues to be at the top, with England second.